Last week I got involved with a customer issue. A refresh of the data imported to a PBIX always works in Power BI Desktop, but the refresh operation intermittently fails in the Power BI Service. Their workaround had been to refresh the PBIX in Desktop and re-upload the file to the Service. This post is about finding and fixing the root cause of the issue - this is as of March 2018, so this behavior may very well change in the future. What is Causing the Data Refresh Error? Why is the Refresh Behavior in the Power BI Service Different than Desktop? -In the Desktop, the query runs through an OLEDB-based provider and the conversion from CLR date to OLE date is handled by our own code (and the faulty value is silently replaced by NULL). -In the Service, the query runs through an ADO.NET-based provider and the conversion from CLR date to OLE date is handled by another layer which does not swallow the error but bubbles it out." So, at this point in time (March 2018), the date conversions are handled differently in the Power BI Service, and the Power BI Service is not tolerant of an invalid date. The invalid dates in my customer's Open Orders table looked mostly like this: 0018-03-01 or 0017-01-01. Year "18" and year "17" are less than the minimum year of "101" allowed by the Power BI Service. The reason I strongly prefer to handle it in the source database is because it's resolved *once* then *all* downstream queries and tools (like Power BI) can take advantage of it. 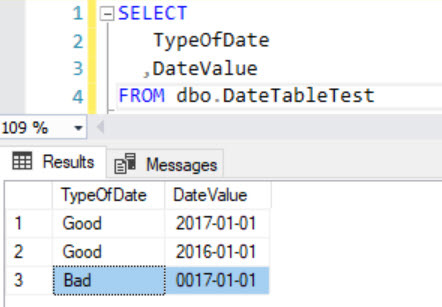 The Custom1 step above finds any date or datetime column in the entire query and, if it's less than the year 101, changes the date to 01/01/1900 (you could change it to a null if you want, but null dates and attributes aren't ideal in reporting scenarios). Since the M script traverses all columns in the query, you'll want to check performance if you have a large set of data. Hope this post is helpful if you find yourself dealing with date-related data refresh errors in the Power BI Service.